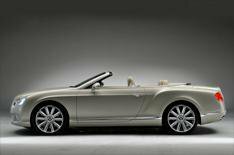 Bentley Continental GTC revealed | What Car? Bentley has released details of its new Continental GTC, the open-top version of its Continental GT coupe. The car will make its public debut at the Frankfurt motor show next month. It features the same round of changes as made to the Continental GT coupe during 2010. The most obvious difference is the re-designed body, which is smoother and sportier than before. The front end, in particular, is sleeker, thanks partly to new aluminium front wings. Elsewhere, increased use of aluminium and other lightweight materials means that the new GTC is 70kg lighter than the current model. Inside, there's the latest entertainment and media systems, including a new touch-screen system and the option of Google-based sat-nav searches. Theres also a new optional neck-warmer system similar to Mercedes Air Scarf that blows warm air to the head and neck of front-seat passengers. Power comes from an updated version of the current cars 6.0-litre W12 engine, with output boosted by 15bhp to 567bhp. Theres a tweaked four-wheel-drive system, with a 40:60 front/rear torque split rather than the previous car's 50:50 split for sportier handling. Prices are yet to be confirmed, but wed expect a starting price of roughly 140,000 around 5000 more than the coupe. The new GTC is available to order now, with the first deliveries expected later this year. A V8 version that will be significantly cheaper to buy and run will be added to the range in 2012. Please note: video has no soundtrack.